Mermaids are everywhere in Norfolk -- though they are not necessarily alive! Throughout the city are colorful mermaid sculptures. The street art display is known as Mermaids on Parade. The city with the world's largest natural harbor naturally has strong ties to the sea. 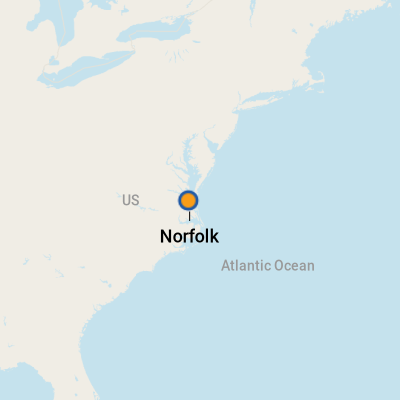 The New Norfolk, as tourism officials like to call it, is a city with a storied maritime history, located at the junction of the Chesapeake Bay and Atlantic Ocean. "Norfolk Towne" was established by English settlers in 1636. The city's importance as a port dates to 1680 when King Charles II ordered the building of storehouses for imports and tobacco exports. By 1775, it was the colony's most profitable locale. The city was bombarded by the British in 1776 (on New Year's Day). Only the walls of what is now St. Paul's church survived. Fort Norfolk (on the Elizabeth River) was built to protect the harbor during the period of tensions that became the War of 1812. The city was incorporated in 1845. The first city hall in 1964 became the final resting place of five-star Army General Douglas MacArthur; it's now the Douglas MacArthur Memorial. Norfolk was surrendered to union troops during the Civil War (but not before an 1862 battle in which the U.S.S. Monitor engaged the C.S.S. Virginia). The city has housed a major Naval base since WWI, and today is home to the world's largest Naval installation. 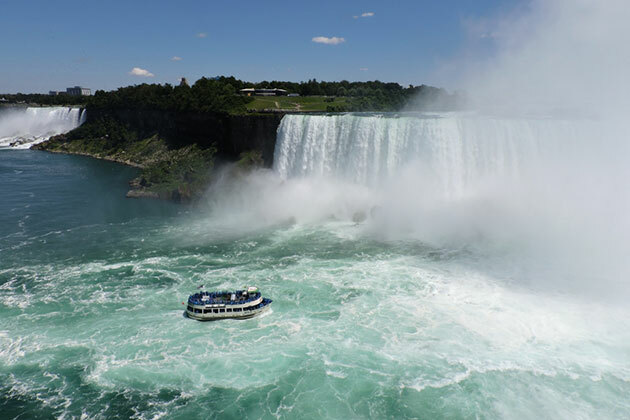 On a visit here you'll notice a few things right away, including the friendliness of the locals (even the security guard at the pier may quiz you to make sure you've seen all the important sights). It's Southern hospitality at its best. You can walk right into the city center from the ship. In addition to being an important Naval town, you'll find Norfolk steeped in Colonial American history. The sights on the Cannonball Trail are well marked, and take you through 400 years of Norfolk history. But you may be surprised to find that history interspersed with plenty of modern touches. Up from the waterfront, for instance, are big bank buildings and commercial high rises with historic gems hidden in between. Head to the giant MacArthur Center (named for the general, of course) shopping mall and you'll discover it's built between St. Paul's, with its historic graveyard, and the 1848 Freemason Street Baptist Church, designed by the same architect (Thomas Walter) who did the giant dome of the U.S. Capitol. Also next to the mall (itself noteworthy as home to a Nordstrom's; important for shoe-lovers) is the 1794 Willoughby-Baylor House. Culture vultures will be pleased to discover Norfolk's lively arts scene, which includes the Virginia Opera and Chrysler Museum. Dining-wise you'll find everything from down-home country cooking to fine cuisine. Norfolk hosts more than 130 festivals year-round, most at Town Point Park, including the big Harborfest in June, a waterfront celebration with tall ships, fireworks, music and lots of partying. Ships use Norfolk's Half Moone Cruise and Celebration Center. Parking for embarking passengers is available downtown via Cedar Grove Parking; complimentary shuttles provide transportation from the Cedar Grove facility to Half Moone. Many of Norfolk's best-known attractions are within walking distance of the pier. Taxis are available at the pier if you want to venture further, say to the artsy area known as Ghent. There are also free NET (Norfolk Electric Transit) city buses that operate around the downtown area Monday - Friday 6:30 a.m. - 11 p.m., Saturday noon - midnight and Sunday noon - 8 p.m. For excursions beyond the downtown area, a car is necessary.